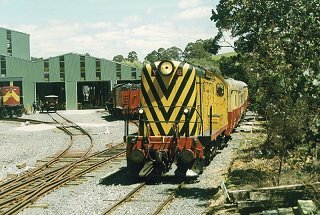 The Don River Railway is a 4km, 3'6" (1067mm) gauge tourist railway and museum, located 3.5km west of Devonport in northwest Tasmania. The railway is open daily (except Christmas day and Good Friday) and trains leave Don hourly from 10:00 am to 4:00 pm. The collection includes restored station building and signal box, 20 locomotives, 30 carriages & over 50 wagons. The society also has a restoration shed at Inveresk in Launceston.